Before you can turn the amazing footage into the next iMovie masterpiece, you must import the video you want to use into iMovie. You can import video from your hard disk, CD, or DVD, and iPhoto rather than directly from a camcorder if you like. To import iMovie HD projects or other videos on your hard drive (or other disks), choose File→Import→Movies and search for the location of the video in the Finder window. Just like when you’re importing video from a camcorder, choose where to stash the recording by making a selection in the pop-up menu. You’ll also need to decide whether to create a new event or add to an existing one, and choose among Large or Full if an HD Import Setting dialog appears. The iMovie HD projects have their own submenu item: File→Import→iMovie HD Project. You’ll also see File→Import→iMovie for iOS Project. Videos you’ve already downloaded to your iPhoto Library are readily accessible in iMovie. Merely click iPhoto Videos in the iMovie Event Library list and choose the event you want. The only caveat is that the video must be in a compatible iMovie format. 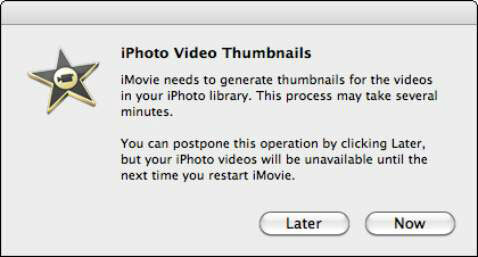 The first time you open iMovie, you may see the message shown here. Click Now to generate thumbnails for the video in your iPhoto library or click Later to postpone this time-consuming chore.